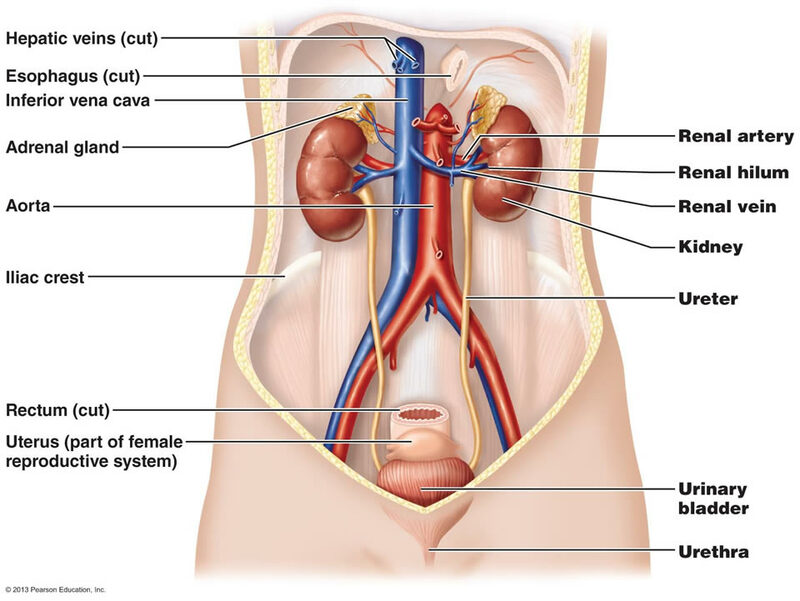 The urinary system consists of the kidneys, ureters, urinary bladder, and urethra. The kidneys filter the blood to remove wastes and produce urine. The ureters, urinary bladder, and urethra together form the urinary tract, which acts as a plumbing system to drain urine from the kidneys, store it, and then release it during urination. Besides filtering and eliminating wastes from the body, the urinary system also maintains the homeostasis of water, ions, pH, blood pressure, calcium and red blood cells. - pH. The kidneys monitor and regulate the levels of hydrogen ions (H+) and bicarbonate ions in the blood to control blood pH. H+ ions are produced as a natural byproduct of the metabolism of dietary proteins and accumulate in the blood over time. The kidneys excrete excess H+ ions into urine for elimination from the body. The kidneys also conserve bicarbonate ions, which act as important pH buffers in the blood. - Osmolarity. The cells of the body need to grow in an isotonic environment in order to maintain their fluid and electrolyte balance. The kidneys maintain the body’s osmotic balance by controlling the amount of water that is filtered out of the blood and excreted into urine. When a person consumes a large amount of water, the kidneys reduce their reabsorption of water to allow the excess water to be excreted in urine. This results in the production of dilute, watery urine. In the case of the body being dehydrated, the kidneys reabsorb as much water as possible back into the blood to produce highly concentrated urine full of excreted ions and wastes. The changes in excretion of water are controlled by antidiuretic hormone (ADH). ADH is produced in the hypothalamus and released by the posterior pituitary gland to help the body retain water. - Blood Pressure. The kidneys monitor the body’s blood pressure to help maintain homeostasis. When blood pressure is elevated, the kidneys can help to reduce blood pressure by reducing the volume of blood in the body. The kidneys are able to reduce blood volume by reducing the reabsorption of water into the blood and producing watery, dilute urine. When blood pressure becomes too low, the kidneys can produce the enzyme renin to constrict blood vessels and produce concentrated urine, which allows more water to remain in the blood. - Calcitriol. Calcitriol is the active form of vitamin D in the human body. It is produced by the kidneys from precursor molecules produced by UV radiation striking the skin. Calcitriol works together with parathyroid hormone (PTH) to raise the level of calcium ions in the bloodstream. When the level of calcium ions in the blood drops below a threshold level, the parathyroid glands release PTH, which in turn stimulates the kidneys to release calcitriol. Calcitriol promotes the small intestine to absorb calcium from food and deposit it into the bloodstream. It also stimulates the osteoclasts of the skeletal system to break down bone matrix to release calcium ions into the blood. - Erythropoietin. Erythropoietin, also known as EPO, is a hormone that is produced by the kidneys to stimulate the production of red blood cells. The kidneys monitor the condition of the blood that passes through their capillaries, including the oxygen-carrying capacity of the blood. When the blood becomes hypoxic, meaning that it is carrying deficient levels of oxygen, cells lining the capillaries begin producing EPO and release it into the bloodstream. EPO travels through the blood to the red bone marrow, where it stimulates hematopoietic cells to increase their rate of red blood cell production. Red blood cells contain hemoglobin, which greatly increases the blood’s oxygen-carrying capacity and effectively ends the hypoxic conditions. - Renin. Renin is not a hormone itself, but an enzyme that the kidneys produce to start the renin-angiotensin system (RAS). The RAS increases blood volume and blood pressure in response to low blood pressure, blood loss, or dehydration. Renin is released into the blood where it catalyzes angiotensinogen from the liver into angiotensin I. Angiotensin I is further catalyzed by another enzyme into Angiotensin II.